We are always being asked the difference between bullion sovereigns and proof ones, or any other type of sovereign. Uncoined gold or silver in the mass; the precious metals when smelted and not perfectly refined, or when refined, but in bars, ingots, or in any form uncoined, as in plate. Gold and silver regarded as raw material. Coin which is base or uncurrent, and therefore of only metallic value. None of the above meanings appear to help explain perfectly the meaning of the expression bullion sovereign, however the reference to "of only metallic value" gives an important clue. When we speak of bullion sovereigns we mean sovereigns bought and sold based on the value of their metallic content. Some confusion over the meaning of the word bullion seems to have arisen recently, and been caused by the Royal Mint. 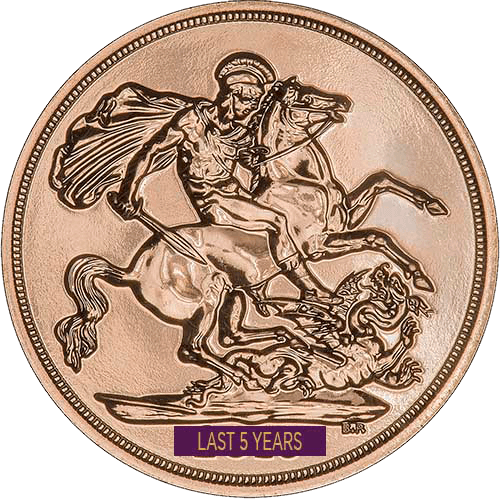 Gold sovereigns used to be a circulating coin, but the last date sovereigns were minted after they ceased to circulate was 1932. no sovereigns were then issued until 1957 when the Mint resumed production to meet world demand for sovereigns as bullion coins, and to help control the number of forgeries which had started to be produced. These sovereigns were simply referred to as sovereigns or gold sovereigns, and were issue in most years until 1982 when production stopped. In 1979, the Royal Mint started to issue proof sovereigns for sale to collectors, and this still continues. In 2000, the Royal Mint decided to restart production or ordinary or normal non-proof sovereigns. To differentiate them from the proof version, they appear to have decided to call them bullion sovereigns, despite the fact that they are sold at prices which represent a considerable premium over their intrinsic metal value. Why they could not stick to established usage and call the non-proof sovereigns uncirculated, we will probably never know. The Americans solve this problem by calling non-proof coins a "business" strike, presumably so-called because it reflects the main business that a mint is involved in. 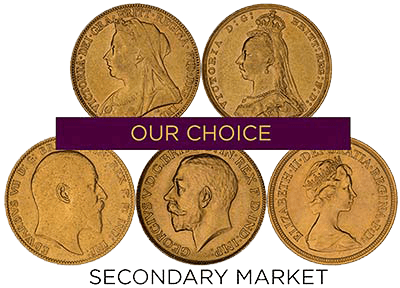 Uncirculated sovereigns, therefore, are new sovereigns struck to a normal circulation grade of finish, as opposed to a proof finish, although many mints take extra care when producing coins intended for collectors rather than for circulation. We have shown two photographs, both of the reverse side of 2000 sovereigns. The top photo shows a proof coin, the lower photo is of an uncirculated one. It is not easy to photograph coins. The background of the proof version looks a very dark chocolate brown, but in real life it is yellow. The contrast between matt and polished surfaces shows up very well on the proof coin and this allows fine details to be seen more easily, whereas on the uncirculated coin, the raised design is also slightly polished, and this results in it being more difficult to distinguish the details of the design from the background. Normally proof coins will sell for higher prices than non-proof ones, however this does not always apply. Our advice is to buy coins for the pleasure you will obtain by owing them, wearing them, or giving them. If you follow this advice, any future value will be a bonus.